It’s not an official SCA project until you bleed on it. My new breastplate and kidney belt have been completed now that the rivets have finally, belatedly, arrived. 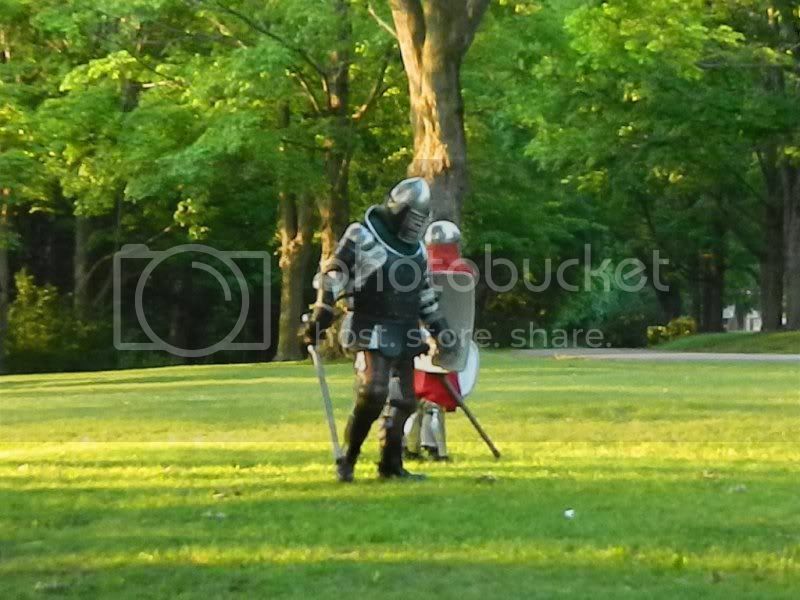 The breastplate is an old 14th century-style globose breastplate from Mad Matt’s Armory which I bought “second-hand” from a friend. I put “second-hand” in quotation marks because that implies it was actually used; in reality it sat in a his basement somewhere for a couple of years and just never got finished. 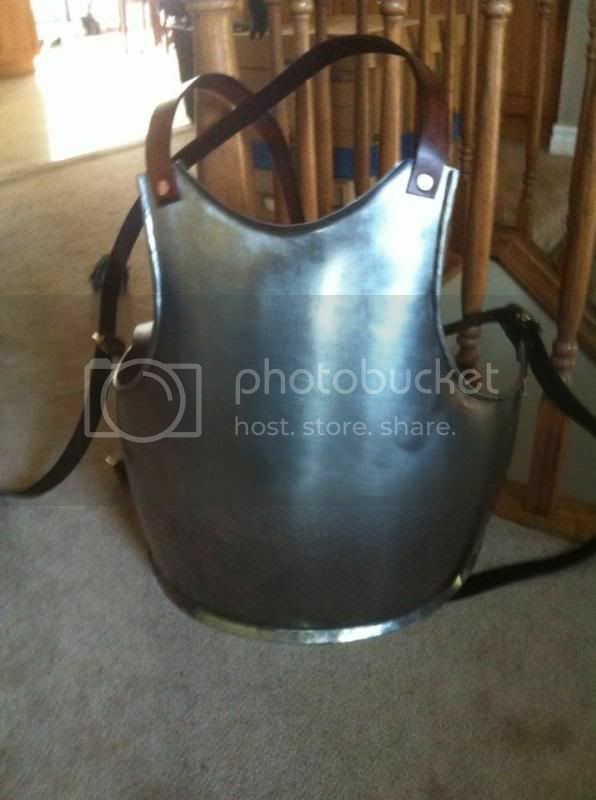 I even had to drill the holes to rivet the new straps to it… and let me say that if ever I had to get shot with an arrow or hit with a lance, I want to be wearing that breastplate. It’s stainless steel and it managed to blunt a cobalt bit in the process of drilling only six 1/4″ holes. But it’s done and ready to go, once I manage to get the straps trimmed down a bit. The kidney belt, however, is the item I’m proudest of. This time last week it was a shoulder of undyed armour/shield leather bend from Tandy. Today it’s a fully-dyed kidney belt of my own design, ready to go… and as the title of the blog post says, it’s an official SCA project (the sinew I used to stitch things together managed to chew through the place on my pinkie finger where my calluses aren’t anymore.) I literally built it from scratch, and I’m pretty proud of it… which is funny because it’s going to be the one piece of armour which won’t show once The Fiancée™ finishes my new gambeson and (eventually) my heraldic surcoat. No pictures yet, I’m afraid. My next project is going to be a new gorget. My old gorget is on extended loan with a friend, along with my entire first suit of armour (the infamous Over-designed Black Leather Kit) which gets him out on the field, but leaves me without a gorget. Since my current helmet, a 14th-century style bascinet, has a fairly sturdy maille aventail (augmented with a quilted cloth aventail underneath) I can technically get away with no gorget under SCA rules… but I don’t like doing that. Not having a gorget makes me nervous: I really want that C4 vertebrae protection. Fortunately, I’ve got enough leather left over that should be able to make a leather gorget and reinforce it with steel splints or plates. And that way, when I get my old gorget back (it’s less than comfortable, I’m afraid) I can just keep it in the loaner kit. The next project after that is to get back to Master B’s workshop and finally get my finger gauntlet project into high gear. It’s been in pieces in a bin for more than a year, and it’s past time for me to get down there and get it re-started. Now that I’ve got my own workshop, I’m fairly confident I can build them myself… once Master B teaches me the necessary skills (and possibly teaches me how to build the stakes and forms.) Once I’ve got that skillset in place, I can build gauntlets and demigauntlets to my heart’s content in the future… and good thing too: gorgets and gauntlets are always needed in any SCA fighting group. Being able to build my own and help others do so will be a big plus in the future.